Nice looking table, easy to assemble 15minutes or so, and a good size for the kitchen! IMPORTANT: DO NOT PLACE BY HEATER VENTS OR RADIATOR VENTS. Dimensions 39.0 In. X 39.0 In. X 31.0 In. Superb quality AND a great MCM look for our Oklahoma City home! I was especially impressed by both the high quality of the walnut veneer legs, and by the thickness and clarity of the glass top. (Yeah, we opted for the glass top over the walnut veneer top.) It looks GREAT with our Elite Manufacturing brushed steel dining chairs -- THE PERFECT MATCH! 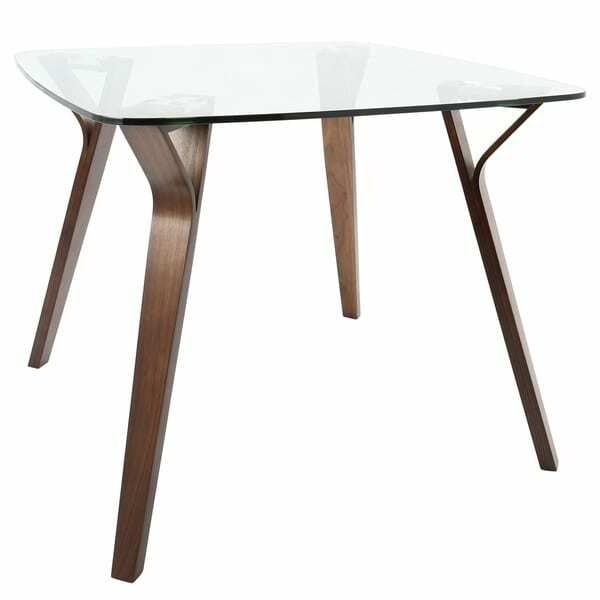 I would definitely recommend this table to friends and colleagues who seek a high quality but small dining table with a sleek, modern look. 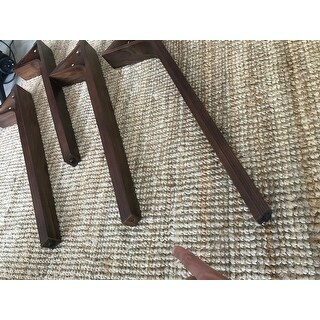 One star review is because it was shipped without the screws, washers, allen wrench and was missing a screw-on table foot for one of the table legs (see photo) This essentially rendered this table useless until I can find alternative replacement parts. 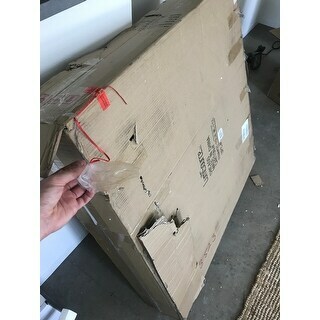 Overstock.com customer service said 2-5 business days for a resolution so I'll have to just hang on to a bunch of styrofoam and cardboard crap in my apartment for nearly a week incase I have to ship it back. Girlfriend is not happy about that. It was not packaged well. The box was all banged up (see photo) and was somewhat falling apart. What looked like a bag (holding it in the photo) that should of housed the screws and table foot was cut open, contents missing and just dangling on some red string. This item was previously unavailable in glass, then the next day I rechecked (was going to order the walnut instead) and it was available so I wonder if they shipped me an already returned item with missing parts which is why some hardware was missing. 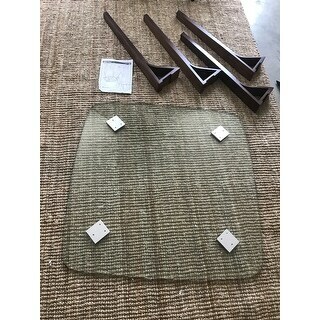 If I had the required parts the table looks like it would be nice but it looked like they just dumped a poorly inspected returned item on me so shame on them. Not a good first impression from Overstock.com. I purchased the Corvus Madonna Mid-Century Walnut dining chairs to go with this, they assembled just fine. The table is very stylish and modern. It wasn't hard to assemble and it is very sturdy. It is exactly what I was looking for! Perfect size and quality table, with heavy glass. Was carefully shipped by Overstock to ensure everything was not damaged. We bought this table for our eat-in kitchen area and it looks great! The color is as pictured and its very sturdy. Took us less then 30 minutes to put together. Good buy. Beautiful Table! Easy to put together. There are two options for this item. One with a wood top and one with a glass top. How can I order the glass top? "How are the legs attached to the glass top? " "My dining chairs are 20" wide at the front (apron/front of seat). What is the opening at the widest point on each side, please?" "Does this come with both the wood and walnut top or must one choose in advance somehow?" There are two options for this table. The all wood walnut version is in stock. The Walnut/Glass Top version will be available for purchase tomorrow. There are two different options.